Help! My Ceiling is Leaking! The weather outside is miserable. You’re hunkered down inside, cosy and warm, when you suddenly become aware that your house is not as dry inside as it should be. You have a ceiling leak – and whatever its severity or cause, you need roof repairs in London or locally as soon as possible. Ceiling leaks don’t always present with running water. They can also announce themselves with a stain or discolouration on the ceiling, a dark spot, mould or mildew, cracking or splitting of paint, a bulge or sag in that part of the ceiling, or a sudden loss of power while it is raining. 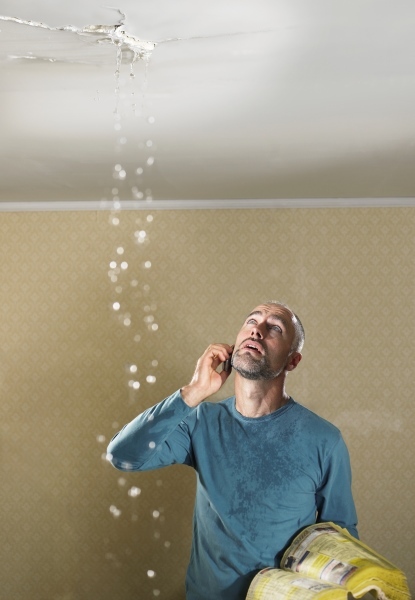 Ceiling leaks usually happen from rain, though they can occur from a leak from an upstairs bathroom. Either way, it is a big nuisance and one that needs to be addressed immediately. Place a bucket or empty tub under the leak to catch the water. Puncture a small hole into the ceiling at the centre of the bulge where the water is running from with a screwdriver to allow the water to drain. This helps relieve pressure on the rest of the ceiling and prevent it from collapsing and causing more damage. If water leaks only when it is raining, or the roof is directly above the leak, then it is likely a roofing issue. If the leak happens below a bathroom or toilet and it is not raining, it’s most likely a plumbing issue. Professionals who carry out roof repairs in London or locally to you are by far your best option for identifying the source of your ceiling leak and fixing it properly and quickly. Many leaks have been developing for a long time by the time you become aware of them, and there may be more unseen damage than you’d expect. Not carrying out repairs immediately can cause sudden, extreme damage to your home in bad weather. Some structural damage can even become irreversible – costing you significantly more in time and money. Ceilings, walls, and floors can be very vulnerable to water damage, as can electricals. Moisture can also cause wood rot and mould, which is very harmful to the health of humans and pets. Wall insulation can also be affected. Don’t delay if you have any indication at all of a leaking ceiling! Call the best roofing company that is local to you and get the problem identified and fixed quickly. The best roofers will check your entire roof to mitigate further issues. Contact us today if you need leaking roof or leaking ceiling repairs.